● Aric Almirola started 12th and finished Stage 1 in seventh to earn four bonus points. ● Almirola pitted during both competition cautions, on laps 10 and 30, for service to his Smithfield Ford. He was eighth during the first caution and fourth during the second caution. ● The third caution of the race was displayed on lap 40, and Almirola once again visited pit road for service and slight adjustments to his Ford Fusion. ● During the stage break, the Tampa native pitted from the top-10 but was relegated to restart 16th for Stage 2 after several competitors did not pit. ● Almirola started Stage 2 in 16th and was 31st at the conclusion. ● Just a few laps into Stage 2, on lap 58, the fourth caution came out for a multicar accident while Almirola was in the 18th spot. He restarted 14th on lap 65. ● By lap 71, the Ford driver reached the top-five for the second time in the race and remained in fourth for the caution on lap 75 and the restart. ● Almirola remained in the top-five until lap 93. On lap 94 he reported that he would need to pit to make it to the Stage 2 break. He brought the Ford Fusion down pit road on lap 95 for fuel and two right-side tires. ● Unfortunately, Almirola sped on pit road in section three and was forced to serve a pass-through penalty just before the stage break. In the meantime, crew chief John Klausmeier confirmed the No. 10’s right-rear tire was punctured. ● During the stage break Almirola visited pit road for fuel, four tires and adjustments to improve his slightly loose-handling racecar. ● Almirola started the final stage in the 30th spot and ended it 23rd. ● During the first run of the final stage, Almirola put himself in the position to be the beneficiary of the free pass, but unfortunately a long green-flag run ensued and additional cars went one lap down. 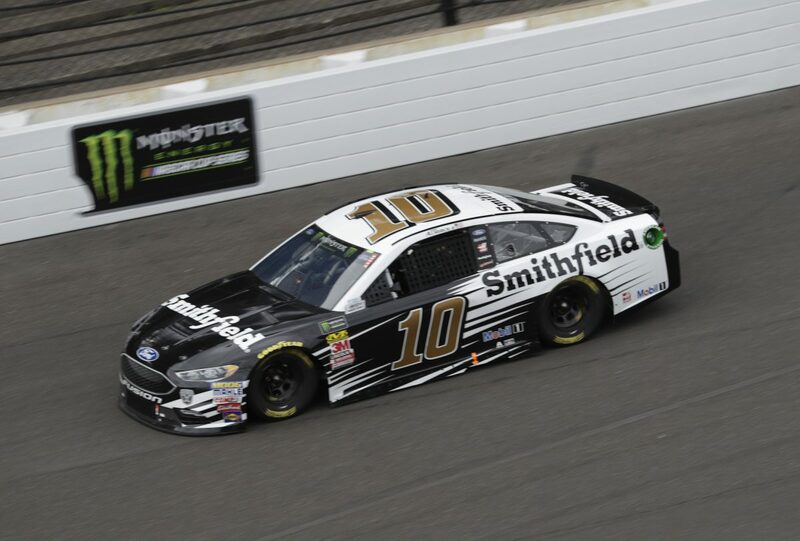 ● Even though Almirola was trapped one lap down for the remainder of the event, the Smithfield Ford had speed. ● Almirola finished seventh in Stage 1 to earn four bonus points. ●Almirola qualified for the playoffs by virtue of his 13th-place finish in the regular-season standings. ● Almirola takes one bonus point into the playoffs via his stage win in July at Chicagoland Speedway in Joliet, Illinois. ● This is Almirola’s second playoff appearance. His first came in 2014.